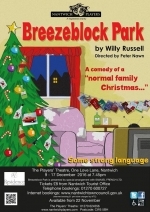 Breezeblock Park is set on a northern council estate over the festive season and, as Russell states, itâ€™s about the glorious mad sadness that seems to manifest itself one way or another, at one time or another, in all families around the festive season. The humour can at times be a touch coarse and crude, but Russell also shows he has a heart and soul for the characters (as he does in Blood Brothers for example) and he gives our heart strings a tug. Of all his plays, this is one of the most â€˜laugh out loudâ€™ and funniest. Set in the mid 70s, it has a nostalgic feel, while retaining characters that are familiar today. It is for most part a â€˜Keeping Up Appearancesâ€™ tale of two sisters vying to outdo each other. Watch them gather for the festivities amid the tired tinsel and fairy lights, squabbling and bickering, petty and jealous, whilst underneath the glitzy gift wrapping and flowing drinks, feathers fly as a secret is revealed and threatens to tear the family apart. Directed by Peter Nawn, performances will be at 7.45pm on 9th â€“ 17th December, 2016. Auditions will be held at the Theatre at 7.45pm on Tuesday 27th September. Non-members may audition by joining and paying membership on the night. Tickets priced at Â£8.00 will be on sale from Nantwich Tourist Office (01270 600727) or on-line at www.nantwichtowncouncil.gov.uk from Tuesday 22nd November 2016.